Mortgage-backed securities worsened Thursday. The Fannie Mae 30-year 3.0 coupon lost 10/32 to close at 105.12, and the Ginnie Mae 30-year 3.0 coupon slipped -15/32. Fannie Mae mortgage bonds are tied to conforming mortgage rates. Ginnie Mae mortgage bonds are tied to FHA mortgage rates. 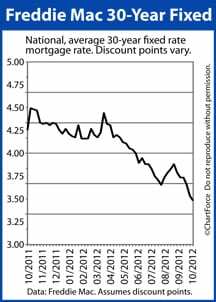 Mortgage rates for both loan types climbed Thursday, as did VA mortgage rates. Jumbo mortgage rates were mostly unchanged. Even as mortgage rates were rising Thursday, Freddie Mac released its weekly mortgage rate survey. The survey showed the average 30-year fixed rate mortgage dropping to 3.36% nationwide — the lowest recorded mortgage rate of all-time. The average 15-year fixed rate mortgage rate also dropped to a new, all-time low, reaching 2.69%. According to Freddie Mac’s respondent banks, mortgage borrowers wanting access to this week’s average rates should be prepared to pay 0.6 discount points plus a full set of closing costs where 0.6 discount points equals 0.6% of the borrower’s loan size and where closing costs vary by state. Of all 50 states, New York is the most expensive state in which to close a mortgage. Missouri is the least expensive state in which to close a mortgage. Click here for the mortgage closing costs in all 50 states. Mortgage pricing opened in the red Thursday morning and moved progressively worse as the day continued. In the morning, the U.S. Department of Labor released its weekly Initial Jobless Claims report. Applications for unemployment benefits climbed by 4,000 to 367,000 — a figure slightly lower than Wall Street estimates. Already important to the future of low mortgage rates, U.S. jobs data has taken on additional importance since the Federal Reserve’s introduction of QE3, a program designed to help stimulate the U.S. housing market. Via QE3, the Federal Reserve buys $40 billion in mortgage-backed bonds monthly to surpress mortgage rates which, the Fed believes, will lead to broader U.S. economic strength. QE3 has no specific end date, but the Federal Reserve has said that when U.S. employment has recovered, that’s when it will start to consider pulling back on the program. These ideas have been shared by Fed Chairman Ben Bernanke since QE3’s launch 3 weeks ago, but were also reiterated in the minutes from the FOMC’s most recent meeting, released Thursday afternoon. Friday morning, the Bureau of Labor Statistics will release its Non-Farm Payrolls (NFP) report for September. The NFP is a monthly market-mover but, again, given the Federal Reserve’s focus on U.S. employment, the jobs report data has added significance to home buyers and refinancing households nationwide. Wall Street expects to see 120,000 net new jobs created in September. If the actual tally exceeds this estimate, mortgage rates are expected to rise. If fewer than 120,000 net new jobs were created, mortgage rates may fall. The Non-Farm Payrolls report will be released at 8:30 AM ET.